Started this discussion. Last reply by I. J. Parker Apr 5, 2013. Started this discussion. Last reply by Jackson Burnett Dec 1, 2012. Started this discussion. Last reply by I. J. Parker Feb 18, 2012. "Thanks for befriending this mystery author! We both replied to the "Attention All Lurkers" discussion, and I checked out your page and thought we should become friends." Beth Groundwater replied to Linton Robinson's discussion If you like "X", then you'll probably like "Y". "I enjoy both Elmore Leonard and Carl Hiaasen and for other zany/humorous Florida or Caribbean locale-based writers that have elements of crime/mystery/heist in their stories, I suggest Dave Barry and Jimmie Buffett." "I went to the Literature Map site and typed in the names of some of my favorite well-known mystery authors. It's a cool tool!" "I'm a fan of Tim Cockey's Hitchcock Sewell undertaker mystery series, and I seem to remember that Hitch has a few favorite Baltimore bar hang-outs. Just as a side-note, for my upcoming TO HELL IN A HANDBASKET mystery set in Breckenridge,…"
"Hi Julie, Thanks for befriending this fellow mystery author!" "Hi Deborah, Thanks for befriending this fellow Sniplits author!" Bestselling author Beth Groundwater writes two mystery series, the Claire Hanover gift basket designer series and the Rocky Mountain Outdoor Adventures series starring whitewater river ranger Mandy Tanner. The first book in her Claire Hanover series, A REAL BASKET CASE, was released in hardcover in 2007 and re-released in trade paperback and ebook in November, 2011. The book garnered good reviews from national reviewers and was nominated for the 2007 Best First Novel Agatha Award. The second book in the series, TO HELL IN A HANDBASKET, was released in hardcover in 2009, also to good reviews, and was re-released in trade paperback and ebook in November, 2012. A BASKET OF TROUBLE, the third book in the series, was released in November, 2013. 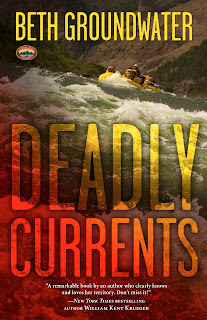 DEADLY CURRENTS, the first book in Beth's Rocky Mountain Outdoor Adventures series starring whitewater river ranger Mandy Tanner, was released in trade paperback and ebook in March, 2011 with good reviews from Booklist, Kirkus Reviews, Library Journal, Publishers Weekly, the Alfred Hitchcock Mystery Magazine, and Mystery Scene, among other reviewers. The Kindle format was a bestseller on Amazon. The second book in the series, WICKED EDDIES, was released in May, 2012 and was a finalist for The Rocky Award, for best mystery set in western North America. The third, FATAL DESCENT, was released in June, 2013. Beth was an avid "river rat" in the 1980s, running whitewater rivers in the eastern US, and enjoyed reacquainting herself with that subculture while researching this series. In June, 2011, she was the parade VIP for the First in Boating on the Arkansas River (FIBArk) whitewater festival in Salida, Colorado, which is featured in DEADLY CURRENTS. Beth lives in Colorado and enjoys its many outdoor activities, including skiing and whitewater rafting. Beth's science fiction novella, THE EPSILON ERIDANI ALTERNATIVE, was released in ebook and paperback in 2009. Also, she has published nine short stories, many multiple times in various formats, including audio. She enjoys meeting with book clubs in person or via Skype or speakerphone to discuss her books. Visit her website at http://bethgroundwater.com/ and her blog at http://bethgroundwater.blogspot.com/ for more information or to arrange a visit. I read a wide variety of books. I'm in a Book Club that meets monthly to discuss literary and women's fiction. Some of my favorite reads from that group were The Birth of Venus by Sarah Dunant, Vanishing Acts by Jodi Picoult, The Namesake by Jhumpa Lahiri, Bel Canto by Ann Patchett, The Curious Incident of the Dog in the Nighttime by Mark Haddon, The Kite Runner by Khaled Hosseini and The Time Travelers Wife by Audrey Niffenegger. I read a lot of mysteries, of course. Some of my favorite authors are Western writers who I've gotten to know at conferences: C.J Box, Kathy Brandt, Christine Goff, Maggie Sefton, and Margaret Coel. I also enjoy light-hearted series by Alexander McCall Smith, Donna Andrews, and Tim Cockey. My all-time favorite mystery writer is Sharyn McCrumb, and I'm collecting all her books. I read romance and science fiction occasionally and have enjoyed Diana Gabaldon, J.D. Robb, Anne McCaffrey and Douglas Adams. I have an absolutely thrilling (to me) announcement to make. Two Wonderful Reviews for Deadly Currents! I'm tickled pink--and red and yellow and orange (fireworks colors!) 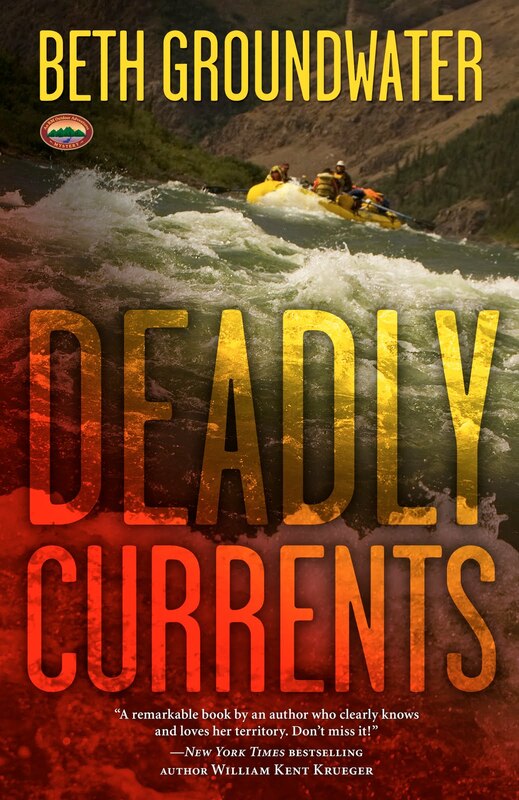 --to announce that I've received two wonderful reviews for my March 8 release, Deadly Currents, the first book in my RM Outdoor Adventures mystery series. At my regular blog I posted a link to an interview that Eden Lane, a reporter for the KBDI 12 public television station in Denver, did with me and other authors present at a benefit signing for the Colorado Humanities and the Colorado Center for the Book. Let me know what you think of it! Thanks for connecting me with this website! Looking forward to reading all the neat things on it! Thanks Beth. I'm looking forward to reading the blogs. Have you read many of Jeffrey Martin's books? Yes, except for his most recent, I've read everything Grisham has ever written. I would like to read your Deadly Currents. I'll be looking for it at the book store. Crime Fiction is my niche. Kimberley Chambers is my current read. Yourself? I would give one or two of such novels a read. Always open to trying books that don't seem to be my usual first choices. As an idea of what I prefer, my two most recent mysteries were The Geneva Trap by Stella Rimington and Blood Line by Lynda LaPlante. Both are latest installlments in series and both were well written. Now I'm into The Bookseller by Mark Pryor. While I have some misgivings about the plot,. the descriptions of Paris are so authentic that I would recommend the book just on its compelling sense of place. Thanks for the add, Beth. Looking forward to getting to know you and your work. Thank you! That would be fine! Also, thank you for the recommendation. I'll check it out.